FixIt is the PUP that uses misleading techniques to prevent removal. Use Reimage to locate malicious components and get rid of them faster than with uninstall instructions. A full system scan blocks virus reappearance and prevents traffic to malicious domains. How reliable is FixIt application? When did I install the program? 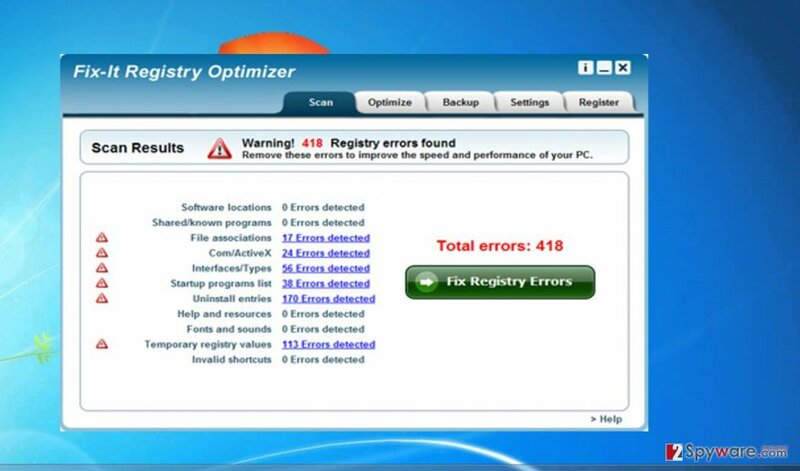 Fixit program offers its services as a PC optimizer. In general, such software is common in the vast spaces of the Internet. Therefore, it is naive to think that all of them are trustworthy and reliable tools which would boost up your system performance tenfold, though the majority claims to do so. Speaking of Fixit software, it is not considered to be a virus. According to its promotional poster, it claims to empower your system processing capabilities by 300%. Among other included features, it manages startup-processes, optimizes your memory, automatically updates drivers as well as provides the suitable conditions for gaming by managing game applications. All this might seem fine and dandy. However, such features and utilities do not come for free or without additional drawbacks. Thus, after using it for a while, some users might want to remove Fixit from the device. If you are willing to so as well, find our instructions below. In addition, Fixit removal can be performed automatically as well. For that purpose, you will need Reimage. This software is not an exceptional tool. There are thousands similar applications in the virtual world. Likewise, if you are searching for such tool, it is not surprising if you get swayed back by hundreds of such applications. Though there are slight variations among them, the main principles are the same. Exploiting the peculiarity of a daily life, in other words, the absence of free time, this tool offers you to boost up the PC, optimize memory, and manage disk space. Among already mentioned supposed benefits, it solves registry issues which might be the crucial factor of the underperforming device. However, all these utilities come with a price. As common for such type of tools, it finds an unexpectedly high number of possible registry issues and errors. 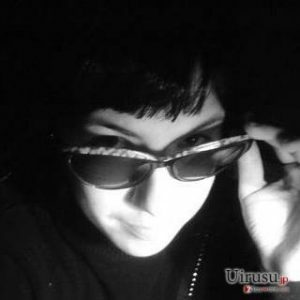 When you think that that “Fix it” button will save the day and automatically will do all the job for you, you encounter the message encouraging to “buy a full version.” Likewise, some people might think that this application is, in fact, Fixit virus. Though it is not malicious, it employs a common strategy to attract attention and to alarm users. Some users, who greatly value cyber protection, might get easily alarmed by such notifications. We would like to shed some light on the matter. Such technique of supposed hundreds of problems on the device aims to convince users to obtain the full version. Once you do it, all the problems are solved within a blink of an eye. As a matter of fact, there were no registry issues in the first place. As for disk optimization, you can do it successfully on your own once in a while without any additional software. If you intend to uninstall Fix-it, proceed further. If you did not install it deliberately, then it might have penetrated into the device along with a recently installed application. Free file converters, media players, and image editors often happen to distribute PC optimizers. What is more, if you download such programs from secondary sources, the probability to accidentally install such PC optimizer is even higher. However, when it comes to invasion, it does not use any specific hijack techniques. In fact, FixIt might come as an add-on under the “Recommended” settings. When users rush through the settings, they often overlook the optionally pre-marked programs. If you want to prevent such programs from entering the device, follow this advice. Upon initiating the installation wizard of any new software, select “Custom” settings. Later on, carefully go through the stages to detect optional programs. Unmark unnecessary and questionable ones and only then continue installing the preferred application. If you are somewhat unsatisfied with the product, you may easily remove Fixit from the device manually or automatically. Speaking of the latter, you may opt for the anti-spyware application, e.g. Reimage or Plumbytes Anti-MalwareMalwarebytes Malwarebytes, to assist you with the process. Do not forget to update it before you will start the elimination process. Alternatively, manual Fixit removal might also be another option. We will present the steps how to uninstall the program the usual way below the article. On the final note, if you are looking for an additional tool to help you maintain the PC processes and performance then should carefully read descriptions and reviews of the program. Other user comments also come in handy. This entry was posted on 2016-11-08 at 00:43 and is filed under System tools, Viruses. You can quickly scan the QR code with your mobile device and have FixIt virus manual removal instructions right in your pocket. How did you remove FixIt virus?